In Dope, Malcolm (Shameik Moore) is carefully surviving life in a tough neighborhood in Los Angeles while juggling college applications, academic interviews, and the SAT. A chance invitation to an underground party leads him into an adventure that could allow him to go from being a geek, to being dope, to ultimately being himself. Perception and reality. Where does one end and the other begin? The way the world chooses to view us can often have an enormous influence on how we ultimately view ourselves -- pigeonholing many people into predetermined roles that they may not actually fit. And so, through superficial expectations, unfair stereotypes, and bigoted assumptions, a high school kid from a poor urban neighborhood might automatically be pegged as a dangerous criminal, even if in reality… he's little more than a harmless geek. Or is he? 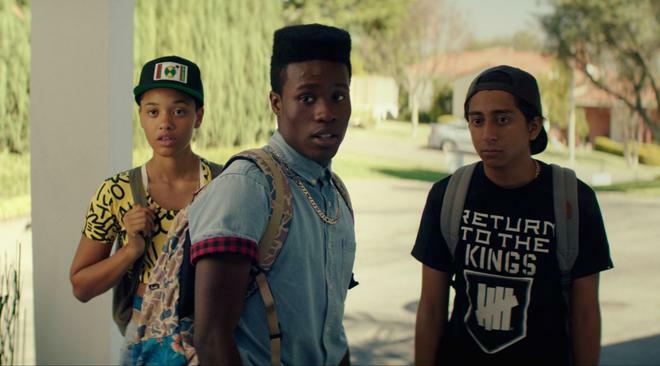 Aimed at questioning misconceptions about race and identity, Rick Famuyiwa's 'Dope' is a teen comedy with an edge, offering a funny, emotional, and legitimately thought-provoking coming of age tale about nerds, Bitcoins, and a bag full of drugs. Malcolm (Shameik Moore) is a good-natured, geeky high school student who loves 90s hip-hop and hopes to attend Harvard after graduation. But growing up in the poor LA suburb known as "The Bottoms" isn't always easy, and soon Malcom and his friends accidently find themselves caught up in a dangerous drug transaction. With his future in the balance, the well-meaning teen will be forced to reconcile his true identity with the one the world keeps trying to thrust upon him, or risk losing everything he's worked so hard to achieve. On the surface, what we get here is a rather enjoyable if not familiar teen coming-of-age comedy that hits several expected beats. The plot involves a student side-tracked from an important college interview and touches upon a few detours involving parties, studying, potential sexual escapades, and even a sporadic gross-out joke -- all elements one might find in a plethora of similar efforts. Likewise, as the character's situation becomes increasingly dangerous, the movie plays up Malcolm's fish-out-of-water status for some solid laughs and drama, revealing just how out of place these lovable outcasts are within the drug trade. At least, initially. But as the runtime progresses, the film touches upon some genuinely interesting concepts related to identity and perception, placing a thoughtful spin on the standard high school comedy. To this end, the movie breaks away from the typical white middle-class experience we see far too often on screen, and instead offers an African American perspective that deliberately plays with and against genre expectations. And as funny and endearing as the movie can be, the third act actually becomes fairly intense, delving into the 21st century world of internet drug dealing without ever completely losing sight of the script's lighter elements. With that said, the filmmakers' approach is not without some issues. Though the movie aims to dissect certain racial and narrative stereotypes, there are times when the script plays too close to conventions without elevating the material or characters beyond their basic tropes. Female roles are particularly underwritten, and through Malcolm and his friends, the writers initially really only trade one cinematic cliché (gangster drug dealers) for another (geeks). Likewise, the movie's darker turns come dangerously close to causing some tonal problems, and a few later scenes involving the story's criminal antagonist feel slightly out of place. To the filmmakers' credit, however, it's this evolving dichotomy between these two dueling worlds that actually ends up leading to some of the movie's most affecting insights. And thankfully, Famuyiwa does end up fusing these clichés to form a protagonist who ultimately feels fleshed out, developed, complicated, relatable, and flawed. It takes some time to get there, but when the full extent of this geek/gangster crossover is finally expressed, the moment hits hard, leading to a particularly powerful climax that features Malcolm directly addressing the audience in a sequence that is sure to leave a lasting impression. Who are we really? What society assumes, or something more? A coming-of-age comedy that delves deep into self-identity, racial/class perception, and the joys of 'Yo! MTV Raps,' 'Dope' is one of those rare teen comedies that offers a bit more bite and insight than your average 'American Pie' sequel. Thanks to a smart script that overcomes some minor stumbles, stylish direction, and great performances, the flick offers a thoughtful celebration of geeks, outcasts, and the musical genius of Ice Cube… you know, before this happened. Universal brings 'Dope' to Blu-ray on a single BD-50 disc that comes housed inside a keepcase with a cardboard slipcover. A separate DVD and instructions for an iTunes/UltraViolet digital copy are included as well. After some skippable trailers, the disc transitions to a traditional menu screen. The movie is provided with a 1080p/AVC MPEG-4 transfer in the 2.40:1 aspect ratio. Clean, sharp, and nicely stylized, this is an excellent video presentation. The digital source is pristine with no pesky compression artifacts or noise in sight. Clarity is strong with a sharp sense of fine detail and dimension, bringing out all the old-school textures and patterns in the characters' throwback 90s clothing. The color palette can veer toward a yellow or cool cast in many scenes, but the faintly stylized look works well with the content, and there is some decent pop in certain wardrobe choices and locations. Contrast is even with balanced whites and deep blacks that don't crush. 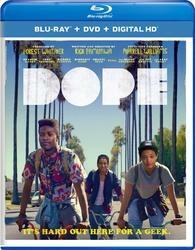 Free from any notable technical issues and marked by pleasing a visual style, 'Dope' looks pretty damn dope on Blu-ray. The film is presented with an English DTS-HD MA 5.1 track along with English SDH, Spanish, and French subtitles. Led by a thumping soundtrack of hip-hop classics and original songs, the mix offers solid immersion and playful personality. Speech is clean and easy to hear throughout with no balance or technical problems. The soundstage is subtle but effective, with naturally spread ambiance that brings a nice sense of atmosphere to different locations (chatter in school hallways, birds chirping outside, boomy bass in a club, etc.). Imaging and directionality are also natural, with occasional effects like a passing car panning between speakers -- though overall activity is fairly minimal. Where the track really comes to life, however, is with the movie's music. From the moment the opening track hits the speakers, the old-school rap songs offer some commanding presence and separation with deep, expansive low frequencies. The film's original punk rock influenced tracks sound great as well, with wide range and strong fidelity during the characters' performances. Like the video, the audio sounds pretty damn dope too. The soundfield isn't always as expansive or nuanced as it could be, but the design work is good and the music comes through great. Dope is Different (HD, 3 min) – Presented in 1080p with Dolby Digital 2.0 audio, this is a short featurette with cast and crew interviews discussing the film's story and characters. Unfortunately, this is light on insights and heavy on plot summary. Dope Music (SD, 3 min) – Presented in 1080p with Dolby Digital 2.0 audio, this is another short featurette with cast and crew interviews. This time the focus is on the movie's original music and loving nods to 90s hip-hop. 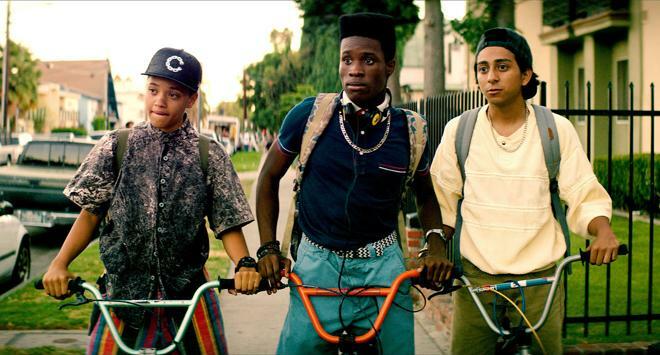 Rick Famuyiwa's 'Dope' is an endearing and thoughtful coming-of-age comedy. Aimed at breaking down African American stereotypes on screen, the film provides an entertaining and insightful peek into the pitfalls of teenage struggles and societal perceptions. On the technical side, the video transfer and audio mix are fantastic. Sadly, supplements are pretty slim and underwhelming. Still, the film itself is the real draw here, and on that front this disc is certainly recommended.